Arreaza thanked the solidarity shown by various governments and organizations in rejection of the attack against President Maduro. 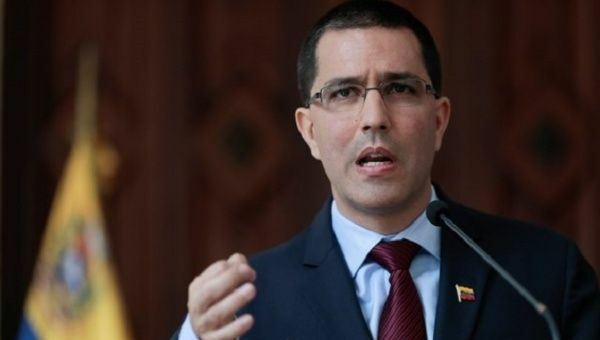 August 5 (teleSUR) The foreign minister of Venezuela Jorge Arreaza said Sunday that the attack against President Nicolas Maduro a day earlier was a manifestation of frustration against the president and against those in positions of state. Arreaza said that the investigations so far point to an involvement by the United States and Colombia. “There is no doubt about the origin of these attacks coming from a Miami-Bogota-Caracas axis,” he said in a foreign minister. The statements were made during an encounter with the diplomatic corps accredited in the country to explain the assassination attempt against the president. Arreaza thanked the solidarity shown by various governments and organizations in rejection of the attack against the president. Hours earlier on Sunday Venezuela’s interior minister Nestor Reverol said that six people had been arrested in the case of drones loaded with explosives that were used as part of an attack against President Nicolas Maduro a day earlier while he was delivering a speech during a military event. Arreaza echoed the details made by the interior minister about the attack which included two drones that carried a kilo of explosives c4 capable of effective damage within a radius of 50 meters. They were piloted aircraft remotely and designed for industrial work and can withstand heavy loads.